Let me introduce, the Valhalla! 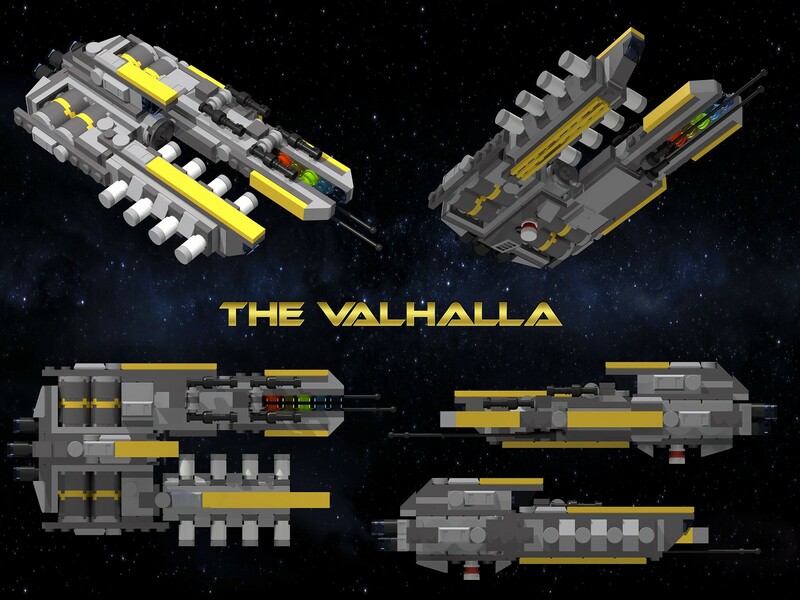 The Valhalla is the mothership of Valkyrie Squad, an elite team of Harbinger exoframe pilots. It mounts a varying array of auto-cannons and torpedo launchers, but it's primary means of attack is a unique weapon affectionately known as the "Bifrost Cannon". The Bifrost Cannon is in fact a Multi-Spectrum Hard-Light Emitter Array (MSHLEA). It is essentially as close to a weaponized gamma ray burst as Labrynthia Corp has ever managed to accomplish. The weapon fires only for a brief few milliseconds at a time before needing to be recharged, but the electromagnetic damage it can unleash can devastate entire planetary infrastructures! Overkill? Maybe. But Labrynthia Corp doesn't mess around. That craziness aside. The second arm of the Valhalla houses the Valkyrie Hanger. This hanger actually opens from the bottom, where Harbinger frames are dropped from low-orbit into battle. Rare circumstances aside, this is the primary means for Valkyrie Squad to be deployed, HALO jumping from space. Because why not add even more craziness to this. Anyway, I hope ya'll enjoy ^^. Those staggered torpedoes look really nice! wont topedos hit other side of ship if they inside like that? or those white cones somthin else? VitorFaria wrote: Those staggered torpedoes look really nice! SamSam wrote: wont topedos hit other side of ship if they inside like that? or those white cones somthin else?